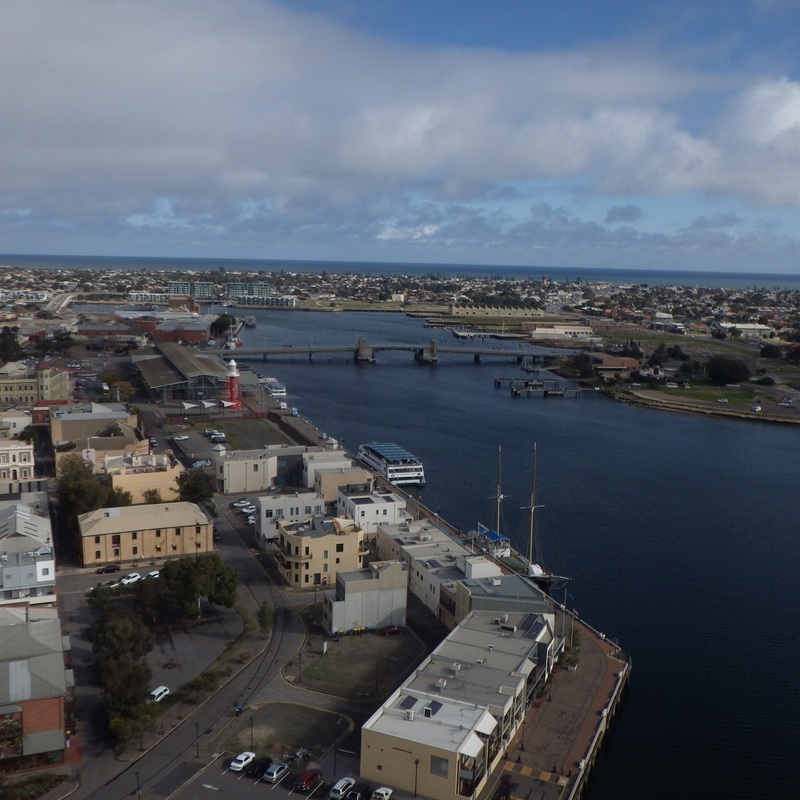 Late last month it was decided to try some KAP over Port Adelaide, taking in the docks and various landmarks in the area. For example, the bridge over the channel, the well-known light-house and various buildings near the docks. An earlier attempt at KAP was foiled by high security fencing all around the planned kite launch area. Today however, I zeroed in on another location much closer to the main dock and lighthouse. In fact, it was right next to the City of Adelaide, a notable old vessel which is awaiting restoration. I think. That's someone else's hobby! To summarize, three flights were done today, to various altitudes. The camera was panned around a little on the last flight. On the final and highest flight, the Fresh Wind Sled kite was finally trimmed close to perfection. Rain in the area stayed away just long enough. Even so, squalls passing to the South pushed the wind speed up rather high from time to time. The panoramic photo below shows the rather small and fenced-off launch area that was used. Quite close to the water! The small dock-side launch area, featuring an historic old boat. Getting here and setting up for KAP was a risk which paid off. Rain was definitely going to be in the area, but I took comfort from the prediction that it would 'contract to the South' during the day. A brief hand-held wind speed check with the meter showed about 10 kph gusting to 16 or so. However, with the meter mounted on its little tripod and perched on the camera quad-pod (a chair! ), a different picture emerged. Over a longer time frame, an average of almost 12kph, gusting to no less than 25kph was recorded. At altitude, the breeze would be well into the 30s. Much cloud movement was evident overhead, and the sun managed to break through quite frequently. 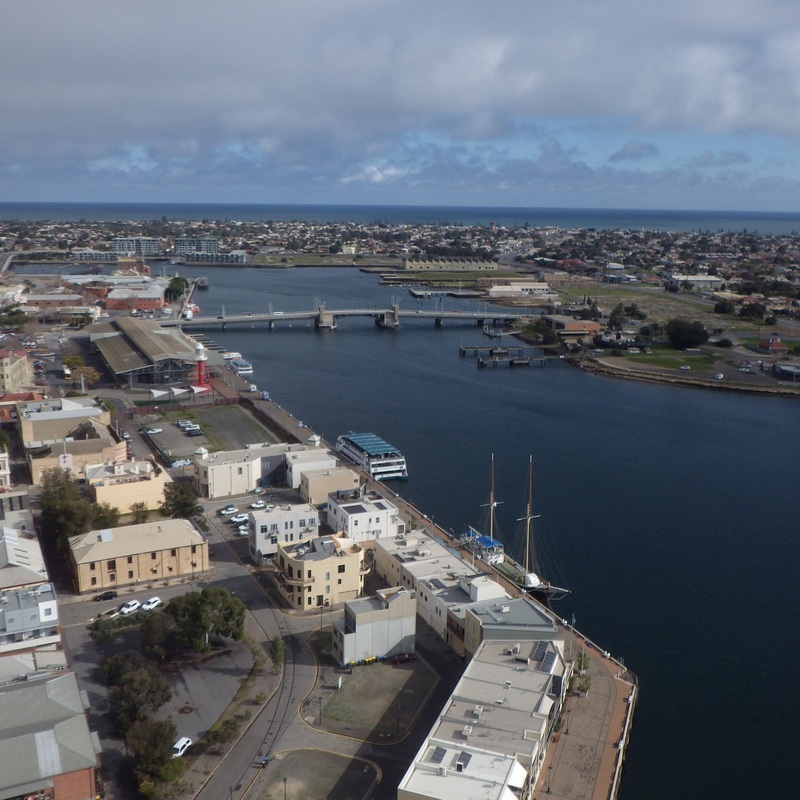 At least some frames would have enough illumination for nice-quality KAP shots of Port Adelaide. The air temperature was around 11 degrees Celsius. Quite chilly by local standards. Lifter: The 1.5m (5ft) tall Fresh Wind Sled. I simply forgot to take a snap of the kite in the air today, as it flew in the brisk SSW air. Trailing twin bright orange drogues. There was too much preoccupation with operating safely out of the restricted flying space! And over sea water, what's more. KAP Rig: Bamboo skewer cradle, suspended from a Half-Picavet line. I use 20 pound braided Dacron, slipping through large shiny paper-clips. Camera pointing roughly West, and angled down slightly as always. Camera: Pentax Optio WG-2 with built-in intervalometer. Both it's shock proofing and water-proofing were tested today! Read the flight report below for details. For the aerial shots, EV was set to -0.7 and focus was fixed on infinity. Which is pretty standard now. 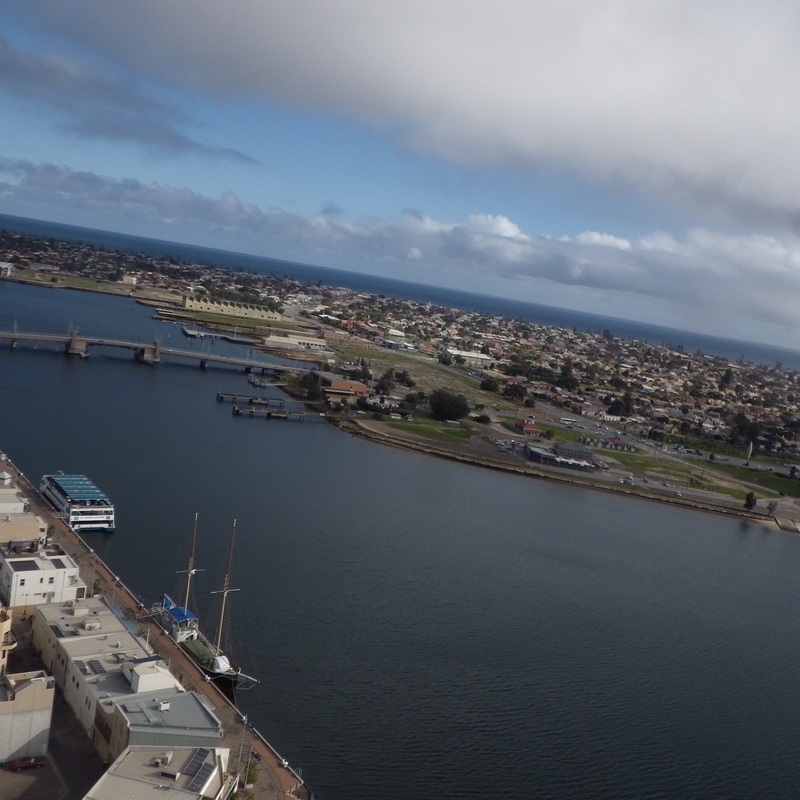 The water of the channel, from 200 feet. Buildings right next to the water-front. The rain approaches - top left. Nice view of lighthouse and bridge. The highest viewpoint, at just over 300 feet. After assessing the wind from the comfort of our car, it seemed that the Fresh Wind Sled was the kite to pick. 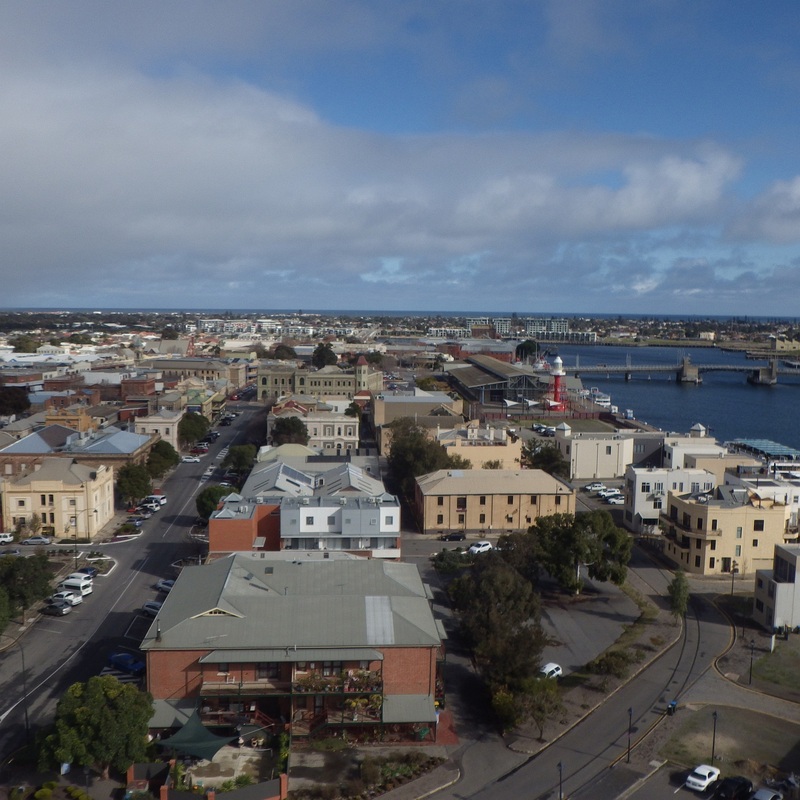 Flags over the Port Adelaide docks were fluttering strongly and the small number of trees in view seemed to swaying about between lulls. The open area of gavel and concrete seemed a lot smaller than it appeared on Google Maps. However, after a longish drive, I had to give it a shot. The camera would soon be dangling hundreds of feet over the cold water of the channel! Setting up went ahead straightforwardly, as did the panoramic photos of the launch area. Completely by coincidence, they featured the hulk of an historic ship, the 'City of Adelaide'. As sometimes happens with this kite, the first flight showed up a tendency to turn in gusts. While still on a fairly short line, and with KAP rig attached, the kite suddenly dove to the right and swept close to the ground. Unavoidably, the bamboo cradle bounced off the gravel two or three times before I managed to bring the kite back in. No harm done, with the springy bamboo doing an excellent job of protecting the $300 camera! After sliding the bridle knot across by a couple of centimeters, I tried again. By now, the camera had started firing off photos after it's initial 4-minute delay! Still, the kite went up successfully and some good shots were obtained. By accident, I had fastened the KAP rig to the 15 meter (50 feet) distance from the kite instead of the usual 100 meters, but thankfully there were no stability problems. So now I know! The larger Multi-Dowel Sled absolutely hates the 15 meter position, causing the rig to swing wildly. This flight was not prolonged, since I knew part of the photo sequence had already been shot. So, soon after reaching full height on 90 meters (300 feet) of line, the kite was carefully pulled down. Back into the tiny launch area, with no issues. However, I had noticed there was still a tendency to pull to the right in gusts, so the bridle knot got another small adjustment. The second flight went smoothly, with the kite performing well. There were periods where the KAP suspension was very steady. After pulling the kite down and flipping through the images on the camera, I realized that it's direction was off. I had intended to use the lighthouse as a reference, but it wasn't visible from the launch area. So, the camera was tweaked around by 20 degrees or more. The kite bridle was given one last tiny adjustment too. This time, for the third flight, the line was let out all the way to 135 meters (450 feet). Going by the previous flight, this would put the kite right on the maximum allowed altitude and get the camera to 300 feet above the water. The fast moving air pulled plenty of tension into the line as I hand-flew the dark-blue slotted Sled the whole time. Pedestrians gazed and a car pulled up at a round-about while the passengers gawked. 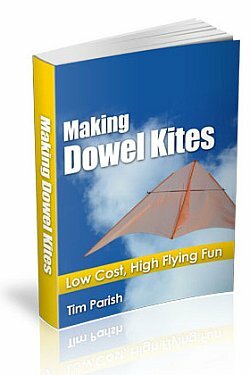 While bringing the kite down, misty rain began to fall. After feeling good about drying out my flying line with a good high fly, it ended up wet anyway. Such is Winter kiting. The last few minutes were a scramble, as I rushed around getting everything back into the car. 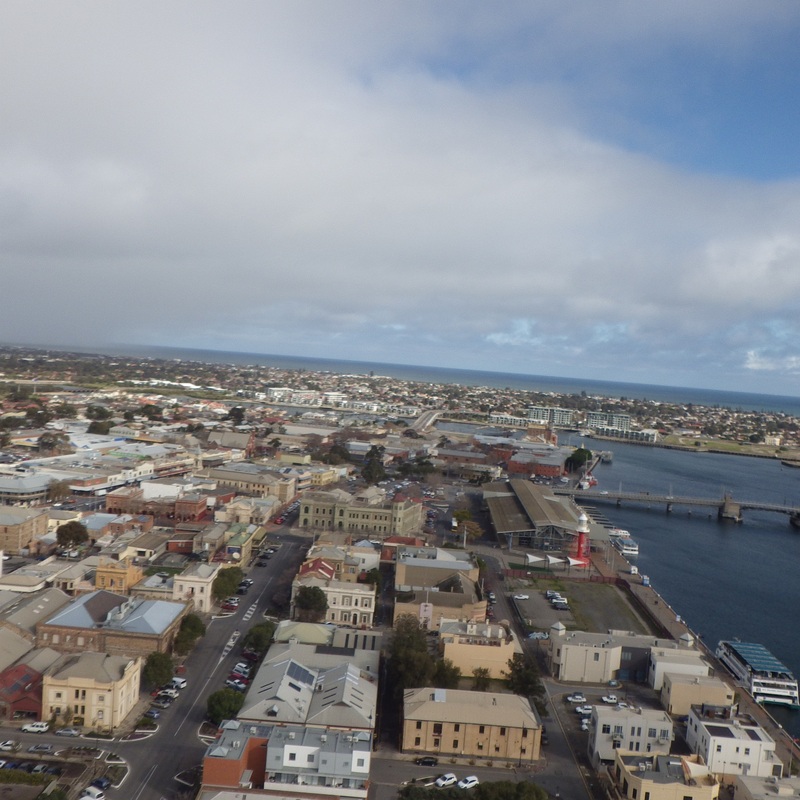 As if to mark the end of the KAP session at Port Adelaide, a large bell began to peal in the distance. It was 12 noon and the whole area was now blanketed in light rain.